Today we share with you a post published by ISKCON, San Diego at http://www.krishnasd.com/ They feel fortunate to have yet another exalted guest: His Holiness Bhakti Vasudeva Swami. 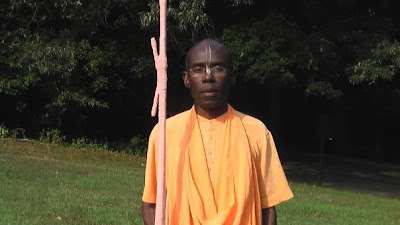 His Holiness Bhakti Vasudeva Swami was born in Bayelsa State, Nigeria. He joined the International Society for Krishna Consciousness (ISKCON) and took diksha initiation from His Holiness Bhakti Tirtha Swami in 1986. In only a few months, he became part of the management committee and later the President of Lagos State Chapter of ISKCON. He was nominated as the Regional Secretary for Nigeria and the West African sub-region in the spring of 1990. In February 2009, Bhakti Vasudeva Swami received sannyasa initiation from His Holiness Jayapataka Swami in Mayapur India. Maharaja travels extensively lecturing on Bhakti Yoga. July 23rd: ISKCON San Deigo Family Picnic. 1:30 pm Mission Bay. July 24th: Srimad Bhagavatam lecture at the temple. 7:30 am – 8:30 am. July 24th: Sunday Krsna Fest Lecture at the temple. 6:00 pm – 7:00 pm. July 27th, Wednesday: Srimad Bhagavatam lecture at the temple. 7:30 am – 8:30 am. July 29th, Friday: Srimad Bhagavatam lecture at the temple. 7:30 am – 8:30 am.